What a pleasure to write a review of a Dave Cousins solo album, so close on the heels of the recently released Boy In A Sailor Suit. After 35 years he released that as his second solo album, then, like London buses, there's another one along in a just a short while. But that's by no means a complaint, as the arrival of a new Dave Cousins album is very much to be celebrated - this one in particular. There's a story behind it - DC decided to book a day in the studio of Chris Tsangarides (producer of Sailor Suit) on 2 Jan this year, the idea being to record an album to sell on tour in the US on his March solo tour. (I was invited to the sessions but wasn't able to go as I was ill - sounds of frustrated webmaster banging head against wall). Dave was intending to delve into the back catalogue, re-recording some tracks from the older days of Strawbs, which he'd feature on the tour. Somewhere along the line two things happened - 1) Dave recruited Melvin Duffy on steel and Hawaiian guitar to play on the session and 2) Dave persuaded Ian Cutler to join him for the first 8 dates of the tour (would have been longer but for prior commitments back in the UK). 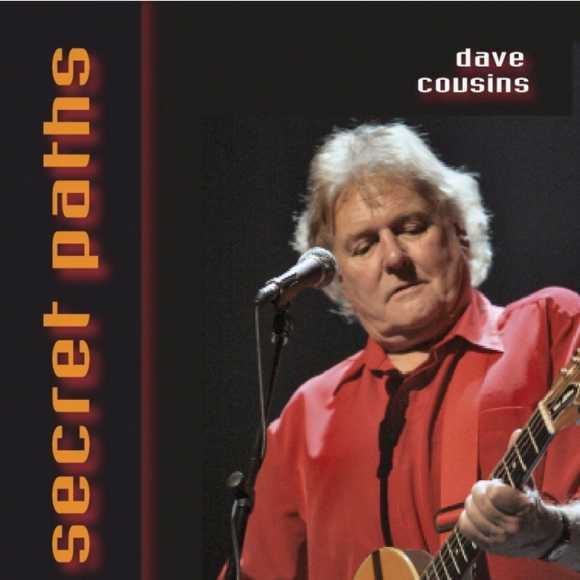 So the result of the session is Secret Paths, released on 3 March. And I have to say it's an absolutely splendid album. I'm not the world's greatest fan of steel guitar generally and wasn't sure I'd like it but I absolutely love it! Melvyn adds texture and ornamentation which really fit with Dave's fairly simple characteristic Cousins strumming and really fantastic DC vocals, the best in my view for some time. The production is very crisp throughout - Chris Tsangarides REALLY knows how best to bring DC's vocals to the fore, and, for someone whose forte is heavy metal, it's really quite astonishing what he's done with this fairly basic, almost Spartan acoustic, more or less live performance of one voice and two instruments. Never before has Dave had such effective production, as far as I'm concerned, partoicularly in respect of his vocals. When analysed track by track, there's a consistency to the songs, which escapes being a "sameness" - with only two instruments to play with, the album could have flagged halfway through, but there's certainly no question of that - it's a compelling sound right through to the last track - DC's homage to Marlene Dietrich. Song Of A Sad Little Girl - steel intro - lovely echo and fairy dust over DC strumming. Verse is DC guitar only, you can hear every nuance of DC's vocal - he's in splendid voice. Steel comes back in for second verse, nothing intrusive just a few grace notes. An instrumental after the second chorus has soaring steel. And the steel shadows and bolsters Dave's voice on the falsetto "and she feels fine" in the end piece. Dave's guitar figure and nice steel harmonics to end. The Shepherd's Song - now we've had several versions of this Strawbs classic of late - the Cousins & Cutler one with manic gypsy fiddling; the Acoustic Strawbs version with Lambert's flailing flamenco strumming; and now this one, with Duffy's steel guitar fleshing out Cousins' strumming (pretty much the same as for the Cutler version). With such riches, it's difficult to pick out a favourite from the three. Again the vocals are absolutely crystal clear. The coda features rising steel picking over Cousins' driving strumming - wasn't certain at first but have come to like this very much. I Turned My Face Into The Wind - one of my favourites on the album. The steel conjures up the eerie feeling of a wild day on a Northern moor; Cousins' vocal on this is superb and haunting - you could almost be back in 1969 when this was first recorded - I'd LOVE to see this one done live. Again, very simple and very effective. Ringing Down The Years - a little more traditional territory for the steel guitar, a slight flavour of Americana to the intro. Cousins' first verse with a simple guitar backing tells the story of his meeting with Sandy Denny, the steel swelling back in during the first chorus. There's a little slowdown motif before each verse which is new to this arrangement. Some nice slide in the instrumental section before the last verse. Josephine For Better Or For Worse - Dave's touching piece written for Dominic Behan and his wife Josephine is great raw material for this pairing - DC picking and Melvin's steel pick up the rhythm and dynamics of this gentle love song. Canada - recently aired on the Strawbs' boxed set A Taste Of Strawbs, this version is re-recorded by Cousins and Duffy, and you know I think I like it better in this simpler stripped down format - you can hear the guitar figures very clearly. The steel keens rather nicely over the guitar in the instrumental, but doesn't otherwise intrude too much, which I think is right for this song. There's a great edge to Dave's voice here. Beautiful steel ending. How I Need You Now (aka Absent Friend) - Slide intro and jazzy chordal work, offering DC an opportunity to croon this atmospheric number from Nomadness. I'll Show You Where To Sleep - now this is a very interesting one - it features an unusual Joni Mitchell-provided tuning, where DC plays some of the chords over the TOP of the guitar neck, It's a gentle slightly slower reworking of a lovely track from Strawbs' first album. Cousins' guitar picking is nicely percussive. The steel picks up the opening figure and the instrumental sections nicely. Beat The Retreat - a favourite Cousins song of mine, which I enjoy playing. Again a slight tinge of Americana from Melyvn, which fits the mood of this country-styled number, also re-recorded at a slightly slower pace than the original version. Cousins' voice is emotional throughout and the song comes to a gentle slowdown close. Falling In Love Again - an unusual thing for Dave to record a cover, this is Dave's version of the famous Marlene Dietrich song. Slightly "cowboy" opening, on the Hawaiian guitar from Melvyn, and a nice instrumental between verse. DC obviously enjoys the opportunity to sing a classic number like this. At one point when band relations were poor back in '73 Dave seriously considered the cabaret circuit - the quality of this shows that if he'd put his mind to it I think he could well have made a success of it. All in all, a very VERY good new album from Dave that hasn't been very far away from my car CD player since I got an early copy from DC, which will be played again and again despite the simplicity of its arrangements. Buy it from Witchwood Records the bonus track, recorded at these sessions "The Broken Hearted Bride", which I've not heard yet - Dave apparently plays dulcimer on this one - be interesting to see how that fits with the steel. This album was released at the beginning of the U.S. tour. At the time of its planned release, Cousins expected to do the entire tour solo but later opted to take Ian Cutler with him. Sadly, Cutler could make only the first eight dates. Although I'm sure that Cousins will acquit himself well on the remainder of the U.S. dates, those of us who heard him with Cutler were blessed. This album is different. Instead of Ian's fiddle, Cousins is accompanied by Melvin Duffy on Pedal Steel Guitar and Weissenhorn Hawaiian Guitar. And it sounds good. It sounds better, if you haven't heard Ian Cutler. But Duffy's work is quite fine � it's just different. It provides a sort of sweet, mellow sound that you don't expect. Many of the tracks on the album are familiar to Cousins and Strawbs fans, a few of which of are "Song Of A Sad Little Girl", "Josephine", "How I Need You", "Beat The Retreat", "I Turned My Face Into The Wind", "Canada" and "Ringing Down The Years" (two of my all time favorites). But the two songs that really stunned me were "Plainsong." A "plainsong" is technically a song that is "monophonic and is in free, rather than measured rhythm" (Wikipedia). But don't be fooled. This is a lovely song, and technicalities go out the window, although Cousins is guided by the spirit of "plainsong." The other one is "Falling In Love Again." And if you want to fall in love again, this is a perfect place to do it. Finally, I never play any album with Dave Cousins on it � Strawbs, solo or otherwise � in my bedroom. It always feels as if he's in there with me � an extra presence. Why? See last sentence, paragraph above. Well what else would you call a review of Secret Paths? If you walk down secret paths in the halflight and climb wooden fences you're bound to end up enveloped in the grassy web of a dancing meadow. Was quite late buying Secret Paths. Didn't actually get it till the electric tour, by which time there was plenty of other things to talk about, so it might be a bit late to start discussing it now. Thought if I waited any longer Lay Down With The Strawbs would be out and I'd never get round to it. Was very dubious of this album at first, because of the steel guitar, but I should have trusted DC. I guess most people who don't know the Strawbs would avoid anything to do with a banjo on the grounds that the instrument can make a dreadful racket, and yet DC has proven that you can get a beautiful sound from it. He's now convinced me that you can do the same with a steel guitar. The steel guitar gives this album a very laid back, chilled out feel. It's the sort of sound you'd expect very late at night in a smoke filled bar. So late, in fact, that all of the jazz musicians have actually gone home. Don't know if you have ever seen the painting "Nighthawks", by Edward Hopper. It's that kind of feel. The steel guitar also gives a kind of American wild west, feel about it. For the track "Canada", this is absolutely perfect. You can feel the wide open expanses of the prairies and the loneliness of the endless journeys in the haunting notes. For some of the other tracks, it's a bit strange at first. "I Turned My Face into the Wind", and "Shepherd's Song" are rooted in the English countryside, and the American feel seems a bit of a juxtaposition. The poetry ceases to be of a modern-day Thomas Hardy's Wessex, but becomes more of a modern-day Robert Frost's New Hampshire. The only totally new song is "Plainsong". This is a really infectious tune, and after a couple of listens you will be waking up in the morning, with the song still playing in your head. Like many of Dave's songs though, the meaning is obscure, but I'm pretty sure that it was inspired by a visit to something like a graveyard near an Abbey on a Winter's day. (I'd even go so far to betting that the date was January the 6th, but I could be reading more in to the song than is really there). All around are the signs of new life. I particularly like the anthropomorphic Catholicism of the image of the birds "breaking bread". Through the chapel walls there's the sound of chanting (Plainsong), possibly by monks, and Dave suddenly becomes aware of his own mortality (he has an epiphany - hence my guess of the date). It isn't morbid, just an acceptance that "ever will I rest". He also seems to be feeling very nostalgic, as there's a few references to old Strawbs songs. ("Fingertips" and "Dragonfly", and also a reference to painted porcelain, presumably the china doll in "The Antiques Suite"). There's also a lovely version of the Blue Angel classic, "Falling in Love Again" featured on the album. Would have liked to have seen a live Blue Angel Orchestra album, which would almost certainly have included this track. The fact that it has now been included on Secret Paths presumably means that their is no plans at the moment to record BAO live. Oh well. Perhaps that means another studio album.